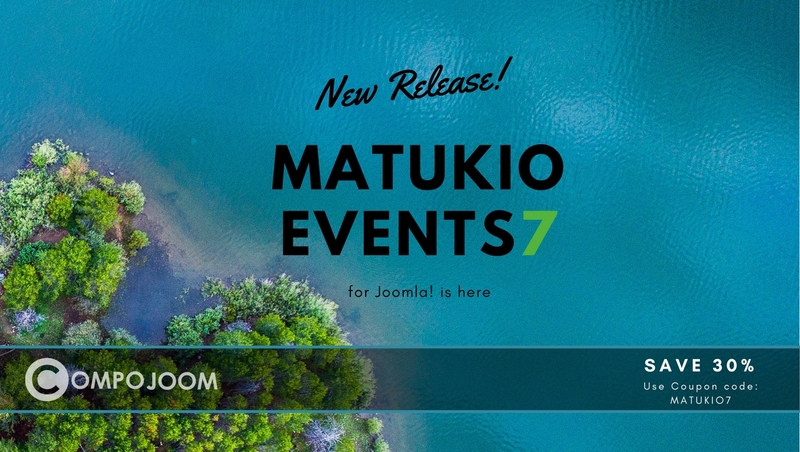 We are proud to announce the first release candidate of Matukio Events 7 for Joomla. Version 7 is one of the biggest releases we ever did, touching almost every file in Matukio. Some statistics: 735 changed files with 24,074 additions and 31,191 deletions (so far). Version 7 integrates CForms into Matukio Events. This revolutionizes the way you create and manage your booking forms. CForms is the fastest Form Builder for Joomla out there, you can create responsive forms in minutes and you directly edit the result. More information can be found on the CForms extension page. With the new Form Builder you get thousands of new ways to optimize your event booking forms and make it more comfortable to book an event. You can add new field types, like date inputs or even file uploads. You can choose from different templates / design and progress bars. You can set up conditions, when fields should be shown or hidden, depending on other fields. And that's not it, there are tons of other features to discover! The old event specific custom fields are gone and you can now override the whole form per event with just one click. All field data can be exported easily now, no more hassle with event specific ones. With all these changes the designs of the booking and payment forms have been updated, to make it even more attractive to book an event. The confirmation page now shows a summary of the booked places and additional choose-able items. We updated and reworked the whole event workflow and made it even more easy to manage events and dates. The dates view has been removed and you can interactively create dates and additional days directly in the event itself, also as organizer from the front-end! Batch generation of dates is possible anytime now and not only during the event creation. Additionally you can have have unlimited files per event. ​Matukio Events 7 brings a complete reworked administrator area, not only for event management. We have invested hundreds of hours into improving the workflow and making Matukio easier to use. We added tips and descriptions and extended the documentation on a lot of areas. A special thanks goes to Ufuk Avcu for helping with that. We hope to get the final version out in the next weeks! Please help us testing the release candidate and give feedback! As all booking and event data needs to be migrated to the new database scheme, we also need testers, which update their Matukio Events installation on a test site and check for errors afterwards. We are not going to add any new features into 7.0.0, but there are already a lot in the pipeline for the next versions. Please make sure you also read the migration guide to version 7.